Squeezing a wedge of lemon into a glass of warm water, Dr. B.M. Hegde says, “It’s the best medicine for an acidic stomach. You don’t have to run to the hospital for every ailment.” “Not even for blocks in your heart,” he asserts. “Blocks in arteries are common,” he points out. The leading cardiologist also notes that in reality there has not been even one per cent absolute increase in the rate of heart attacks. It is a plain hype, he says and calls it a labelling error. Unfortunately, every chest pain is dubbed as angina and every block is labelled coronary disease,” declares Dr.Hegde. “The flaw of today’s approach to treatment is that the human body is seen as a car machine which can be repaired part by part. Whereas, the human body is a whole entity and should be treated in entirety. How else can one explain the side-effect of drugs used to treat one organ, affecting the other organs?” he asks. 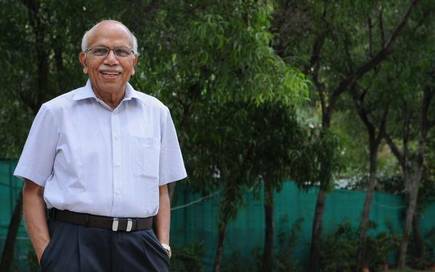 Author of over 40 books, Dr.Hegde also supports alternative forms of medicine like Ayurveda. Quoting Sanskrit texts from Ayurveda, he explains how any treatment ought to be holistic. “Ayurveda has unfortunately been relegated to back seat, in spite of being traditional and rich form of medical treatment,” he says. “Health is about the environment you live in and the mind is the environment of the body. It’s not what you eat but what eats you (the thoughts) kills you,” he says. “The key is to cultivate positive thoughts and surround yourself with positive emotions. Quantam healing is the new method of healing. Your mind can heal you.” He suggests the book Quantam doctor by Amit Goswami. Dr.Hegde opposes the burgeoning fitness craze among the young urbane crowd driven by the belief that fitness leads to good health. “Health is in the mind and fitness is in the muscle. These are two different things but often confused as one. If someone is fit to run a marathon doesn’t mean he/she is fit to live a healthy life.” “Health is not even absence of disease, as all of us have diseases. We all will have over 100 cancer cells at any given time, but they don’t become clinical cancer as they die on their own.” Quoting a sloka from Ayurveda, Dr.Hegde defines health as the enthusiasm to work and love. “Keep the enthusiasm in you alive, nurture positivity and cull negativity and you are healthy”, is his simple mantra. Dr.Hegde was in the city to deliver a guest lecture on ‘Spirituality and Health’ at the Madurai Readers’ Club.